Via Litsy*, which is the only social network I spend considerable time on anymore, I encountered the concept of the "TBR Bingo," where you put a bunch of books that you want to read onto a bingo card, and then read the books and try to get a bingo. 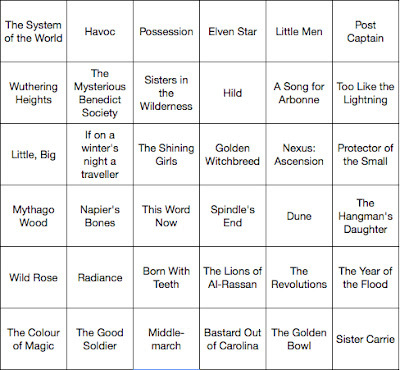 Some people on Litsy use their TBR Bingos as motivational or behaviour modification tools (e.g. no buying new books until you get a bingo), and I don't think that I'm doing that. I counted up the books on my unread bookshelf and there were over 24 of them, so they wouldn't neatly fit onto the traditional 5x5 bingo card with a free space in the centre. So I decided to make a 6x6 grid with the vast majority of my unread bookshelf books, then threw on some List books. I'm not going to be rewarding myself for any hypothetic bingos, I'm mostly just really eager to see how many of these squares I complete over the course of the year. I'll make an effort to post occasional updates.